TAAP’s 2018 Capital Pride Parade Contingent before the parade started. On June 9th, 2018, fifteen asexual people marched in the 2018 Capital Pride parade with The Asexual Awareness Project. This effort was made possible by donations from members of Asexuals of the Mid-Atlantic that covered the costs of the entry fee, a professionally printed banner (seen in the picture above), and stickers to pass out to viewers on the sidelines. In 2016 and 2017, the Asexuals of the Mid-Atlantic viewed the parade from the sidelines, and in 2017 a portion of the group also attended the Capital Pride Festival together. While there were some asexual people to be found among the crowds in these years, there were very few representations of asexuality in the parade and festival booths themselves. Isabel N. holding the ace flag and rainbow flag on the sidelines of the 2016 Capital Pride Parade. Members of Asexuals of the Mid-Atlantic at the sidelines of the 2017 Capital Pride Parade. In addition to TAAP marching in the parade, there was a noticeable increase in asexual representation at Capital Pride 2018 in general. The word “asexual” was included in the graphic used to advertise the theme for the year, which was “Elements of Us.” Many more booths at the festival had ace flags this year than in 2017. An ace flag found on the Kaiser Permanente contingent’s parade float. 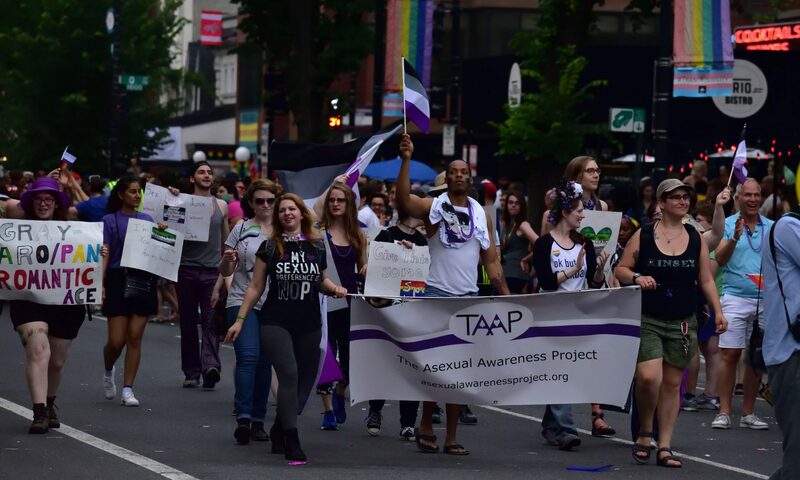 TAAP plans on marching again at the 2019 Capital Pride Parade, and hopes to see even more asexual representation at future pride celebrations. If you would like to donate to help us make this happen, please visit our donate page for instructions.